World Peas Brand – The Number 1 better for you Snack! Crispy, Crunchy, flavorful Goodness! or have Peatos™ delivered straight to your door! It’s simple: in all things you look for the better option. You want the better seat at the movie theater, you want the better Dentist (preferably one that doesn’t shame you when you forget to floss), and OF COURSE you want the better snack. 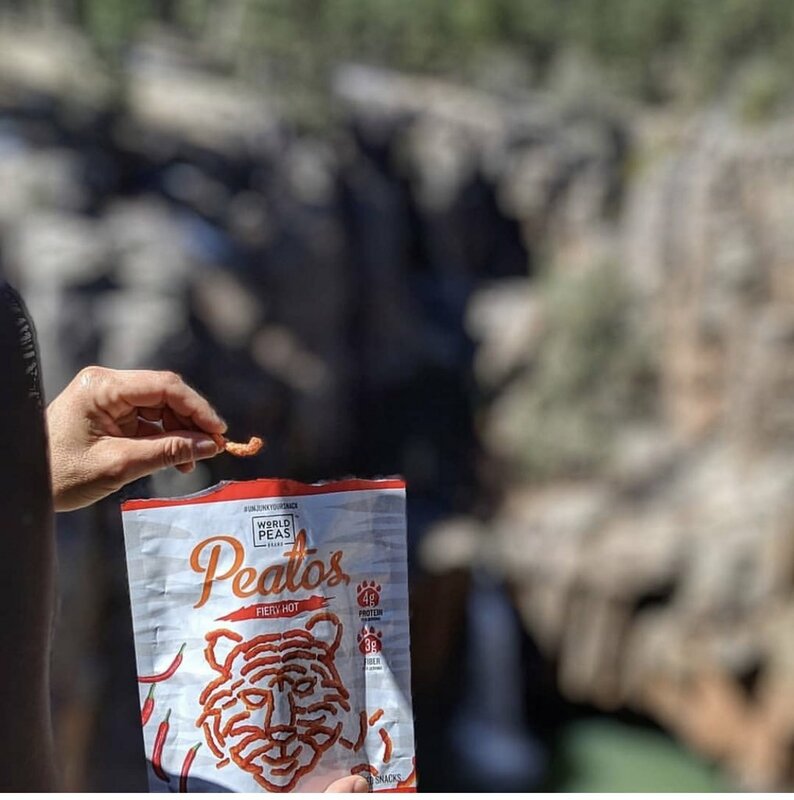 CHEETOS® is a registered trademark of Frito-Lay North America, Inc.
Plant Based Protein is at the heart of our mission to change the way the world snacks! World Peas™ replaces the traditional base (e.g., Corn and Potatoes) used in salty snacks with Pulses (Peas and Lentils), to deliver Better ingredients, Better nutrition, and Better flavor. We make “junk food” you can feel Better about! Pulses: They make us Better! You want to know why we’re Better Than Junk Food™? It’s thanks to these plant-protein powerhouse ingredients. Pulses, the edible seeds of peas and lentils, are an almost magical ingredient: naturally delivering powerful plant-protein and fiber. These SuperFoods pack a nutritional punch: non-GMO, gluten free, and sustainably grown, in addition to delivering vitamins and minerals. Dig into a bag of Peatos™ knowing you’ve got your fingers on the pulse of a snacking revolution. How are Peatos™ Better Than Junk Food™? Because they deliver bold flavor and bigtime crunch with clean ingredients! We cut out the basic junk food ingredients like corn and potatoes and sub in nutrient-dense pulses. Powerhouse pulses — we use peas and lentils – provide an awesome nutritional base and solid plant-based protein for all our bold and crave-able flavors. It’s “junk food” without the junk! How are Peatos™ made? Are they baked? Are they fried? Are they magic? Our proprietary process is what gives Peatos™ their crave-able flavors and bold crunch. We pack in all the serious “fried snack” taste you long for, but we don’t use any frying. In the U-S of A! What do I do with my Cheetos®? Where can I find this addictively crunchy snack? Peatos™ are taking the country by storm and are likely in a store near you! You can find our snacks in the produce section. Use our store tracker to find a store near you and get your hands on some Peatos™! If stores near you don’t have Peatos™ yet, don’t worry. We’ve got you and your taste buds covered — just order Peatos™ online. Do you use any artificial flavors? Peatos™ only uses natural flavors that get pulled straight from fruits, vegetables, or plants — NOT artificial flavors made in a lab. The deliciously bold flavors in Peatos™ come from real food ingredients. What does “no synthetic colors” mean? We stay away from artificial, man-made colors like Red 40 and Yellow 6 (the favorite phony colors of that cheetah). You should know by now — we keep it real with bold colors that come right from natural sources, like vegetables, real cheese, and spices! Masala and Fiery Hot Peatos™ are totally vegan and ready to satisfy your snack cravings! Chili Cheese and Classic Cheese Peatos™ are vegetarian, but not vegan as they are made with real cheese. Can I still have Peatos™ if I have food allergies? We don’t use wheat, soybeans, tree-nuts, or sesame in Peatos™. We do use dairy for select flavors. Peatos™ are produced in a facility that also packages products that do contain wheat, soy, tree-nut, milk, and sesame products. So, if you have severe allergies Peatos™ may not be the snack for you. What is yeast extract, and why do you mix that in? Yeast extract comes from the same yeast that’s in bread and beer (both pretty cool things). Don’t let the “yeast” part fool you; this extract is totally gluten-free! It’s the leftover part of the yeast after the yeast-multiplying magic happens and the cell wall gets broken down. Yeast extract brings the thrilling, salty, and umami flavors you crave to Peatos™. Do your snacks have added MSG? No, we never add MSG. But it’s worth noting that small amounts of MSG sometimes show up naturally in ingredients like tomatoes and cheeses. Sorry to all you MSG lovers out there – stick to Chinese takeout! No thanks, I am very rich!